Lately, I've been eating a LOT of 0% greek yogurt with some SF (sugar free) jam, and needed to replenish. I usually buy Smuckers brand No Sugar added jams. I know they are made with concentrated grape juice as the sweetener (so, sugar, but let's not get hung up on *words*), and depending on the flavor (and where I buy it, i.e. Canada or the US) it's about 20 calories per Tablespoon. So I finally decided to check out OTHER jam. I wound up sticking to the double/triple fruit kind, because as I looked through the labels, I saw right away, regular jam, OMG, high calories! That stuff is pure sugar (or high fructose corn syrup... don't get me started). The Smuckers brand Double Fruit ALSO has 20 calories for 1 Tablespoon, has sugar in place of the grape juice, and that's about it for differences. 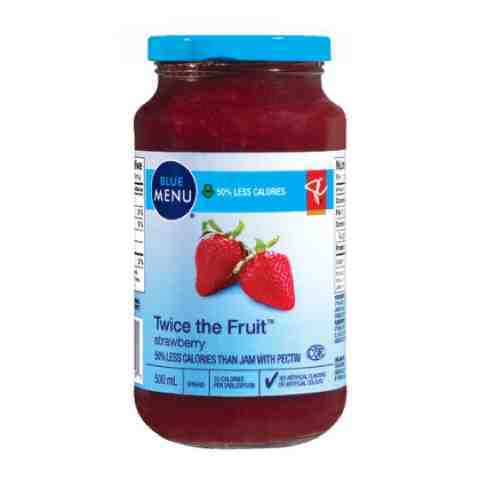 And my store's own "healthy" line (the labels are blue, and are always less fat, less sugar, less sodium, than the competing brand)-- a 500ml jar of "twice the fruit" strawberry for 3.99. And it's 25cal per tablespoon. So, for less money, a much bigger jar, and basically the SAME product, I'll be going with store brand double fruit from now on. It pays to read the labels, folks. And as always, MATH!